Protecting mothers and children throughout Washington, D.C. The failure to diagnose preeclampsia in a pregnant or postpartum woman can have devastating effects. At Paulson & Nace, PLLC, we help new families whose lives have been forever changed by this act of medical negligence. For the last four decades, our skilled team of medical malpractice attorneys has offered comprehensive counsel to clients throughout Washington, D.C. whose lives have been irrevocably changed after a doctor failed to monitor, diagnose or treat a mother for preeclampsia. What is preeclampsia, and what does it cause? Some mothers, however, experience no symptoms at all. That is why it is crucial that doctors monitor expectant and postpartum mothers carefully, using the right tests and procedures, to ensure that any changes to their vital signs or general health are noted quickly. A woman with preeclampsia could experience a sharp spike in her blood pressure; if so, she should immediately tell her doctor, even if she experiences no other symptoms of the condition. Women carrying multiple fetuses, those who are overweight or those who have a family medical history of preeclampsia are more likely to develop the condition. It is also associated with women who are older than 40 when they get pregnant, and with women who have no other children by birth. HELLP syndrome. HELLP stands for “hemolysis, elevated liver enzymes and low platelet count,” as the Mayo clinic explains it. A mother with HELLP syndrome may not survive, as the syndrome is indicative of damage to multiple organs. If left undiagnosed in an expecting mother, the child may also die as a result. Eclampsia. A serious seizure disorder that can develop during the pregnancy or after it, eclampsia often requires the doctor to deliver the baby, even if the mother has not reached a safe place in her pregnancy to do so. The seizures could lead to brain damage, and some children experience skull fractures or developmental delays. It can be fatal to the baby and the mother. Placental abruption. A placental abruption occurs when the “placenta peels away from the inner wall of the uterus before delivery.” It can cause internal bleeding in the mother, and cut off oxygen and nutrients to the fetus. The oxygen deprivation alone can cause low birth weights, brain damage and premature births. Heart disease. Preeclampsia can lead to an increased risk of a mother developing cardiovascular and heart disease later on in life. At Paulson & Nace, we understand just how serious the effects of undiagnosed preeclampsia might be. We help protect your rights and your future when an act of medical malpractice puts your life, or the life of your child, in jeopardy. We treat you with the respect and dignity you deserve, and offer practical advice and empathetic support during this difficult time. 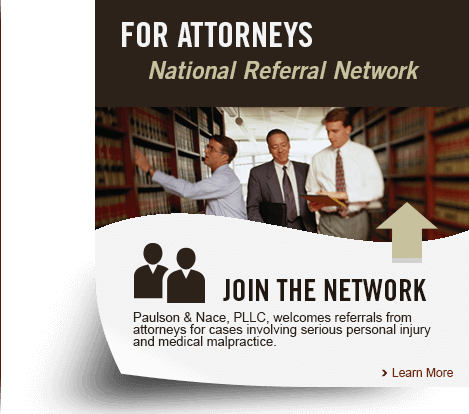 Paulson & Nace, PLLC, is a premier medical malpractice law firm serving victims throughout Washington, D.C., and West Virginia. If your doctor failed to diagnose preeclampsia, thus endangering your life or your baby’s, we want to hear your story. Please call 202-930-0292 or fill out our contact form to schedule a no-obligation consultation with a dedicated birth injury attorney from our firm. $50 million verdict for young mother injured during childbirth.